Motorola is back in South Africa from 1 November, after it quietly disappeared from the country in 2012. Its exit followed Google’s acquisition of Motorola Mobility in August 2011, and its return comes after Lenovo bought it from Google in 2014. Lenovo has since abandoned the Motorola brand name, opting to use “Moto”. Lenovo said it will bring a host of new Moto devices to South Africa, with the Moto Z leading the charge. 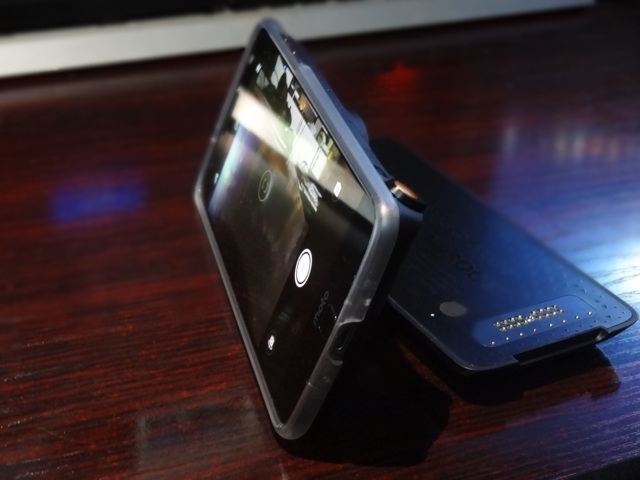 The stand-out feature of the Moto Z is its modular design, which lets you attach a variety of accessories to the back of the device. At launch, the Moto Z will have accessories like an extended power pack from Incipio, a Hasselblad camera attachment, and JBL speaker with kickstand. Mods snap onto the back of the device without needing to power it down or reboot the phone. They are held firmly in place with strong magnets. While it may not sound secure, the magnets really are strong. To remove a mod, you put the tip of your finger between it and the bottom edge of the phone. At over R4,000 each, mods like the Hasselblad True Zoom and Moto Insta-Share Projector are expensive. However, Lenovo said it will not change the form factor of the Moto Z mods – meaning they remain compatible with future Moto Z devices. Lenovo has committed to maintain mod compatibility for at least two generations of Moto Z smartphones. 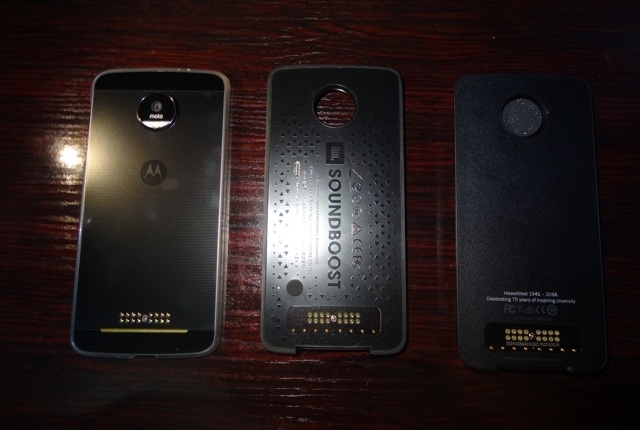 It is also providing developer kits for third parties to build their own mods for the Moto Z range, and has set up an incubator to help fund the best mod ideas. Even without the modular architecture, the Moto Z is a solid flagship Android smartphone. Moto’s software is essentially vanilla Android, and hardware-wise it is a high-end smartphone. Specifications include a great set of cameras (DxOMark score of 84), powerful system-on-chip, large high-resolution display, and a fingerprint sensor. It is not rated water or dustproof, but has a water-repelling nano coating. It ditched the headphone jack – a USB-C to 3.5mm adapter is included in the box. With the Moto Z, Lenovo is offering an interesting flagship Android phone. While the lack of 3.5mm jack will be a deal-breaker for some, between the adapter and Bluetooth headphones, I didn’t really miss it. Moto’s major problem in South Africa is its price. It is going toe-to-toe with the iPhone 7 and Samsung Galaxy S7, and is also facing challengers like the Huawei P9, LG G5, and Sony Xperia XZ. The Moto Z is set to go on sale at Takealot and Cellucity on 1 November. Dion Wired is scheduled to carry it from 13 November. Lenovo has said that Vodacom will have the Moto Z on contract, but details and prices are not yet available. Battery life. Good – More than a week on standby, and well over a day with moderate use. Display. Excellent – High resolution with good viewing in sunlight. Storage. 13GB of 32GB available. Choice between microSD or second SIM. Network. LTE support for Vodacom, MTN, Cell C, and Telkom’s networks. Dual SIM if microSD card not used. Cameras. Great – Takes good shots in a variety of lighting conditions and distances from subject.